The museum shop is available to use for all visiting parties during their time at the museum. There are many items geared towards school children, at a very affordable price. There should be (time permitting) chance for your group to visit the gift shop during their visit. We also offer a goody bag service which can be prepared in advance at any price you choose. This can make the visit easier for schools especially as they are often pressed for time. If you wish to use this facility, please contact the gift shop manager, at least one week prior to your visit, who can advise on a selection of suitable items to suit your theme of study. The bags will be ready for you to take at the end of your visit. Below is an example goodie bag costing £3.20. 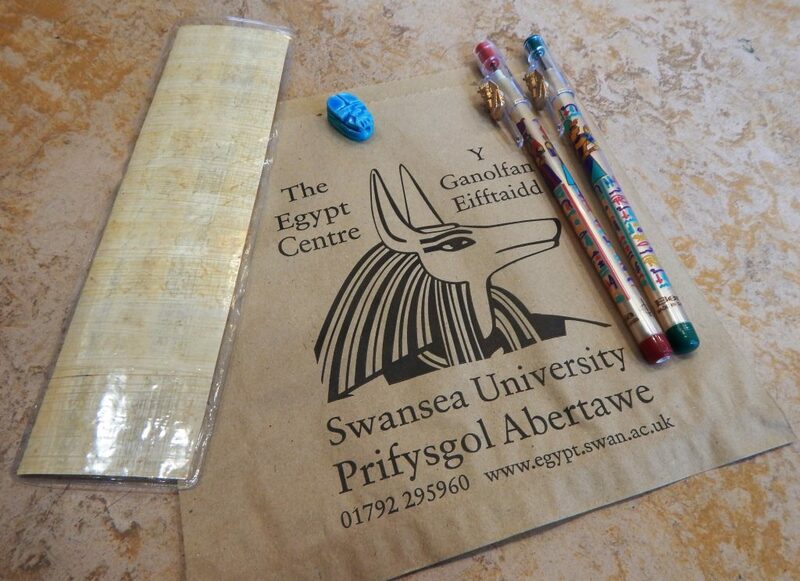 Items include a Pharaoh pen and pencil, a scarab beetle and papyrus bookmark. Here is a list of some of the items that we offer in the goody bags. We can also provide childrens party bags. Please ring the Gift Shop Manager on 01792 602660 for more information.